Try your hand at an indoor winter garden! You can have fresh salad greens year round by growing lettuce indoors. If you give lettuce what it needs, you can be successful and provide your family with baby greens that will rival those store-bought clam shells of salad greens. Lettuce has different needs than microgreens, so keep that in mind. Baby lettuce has a long tap root. They need a deeper pot than microgreens. If you can give them at least four inches of soil depth, your lettuce will have room to grow. The deeper one-pound plastic clam shells that organic greens are often sold in are 4″ deep. That’s just the right size container to grow lettuce in. If you have some of these to recycle, they’re ideal for growing lettuce indoors. I recommend using a sterilized organic seed potting mix for indoor growing. 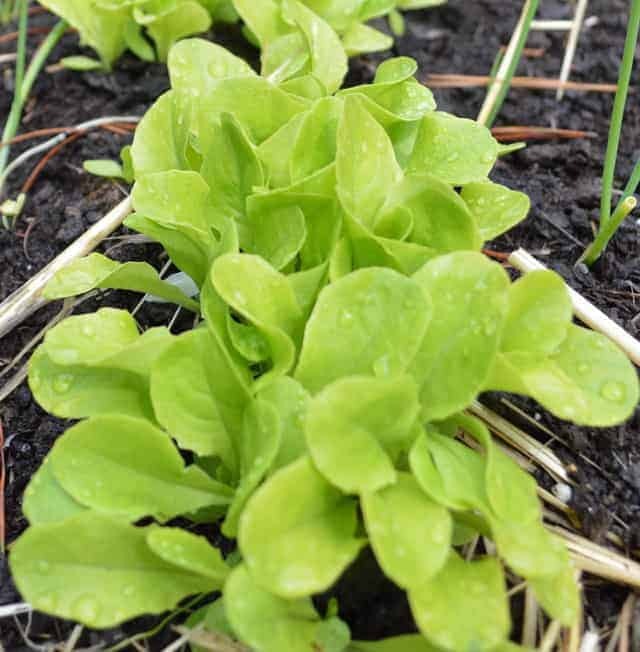 If you are using a commercial potting mix, add 1/4 cup of kelp meal, and 1/3 cup of worm castings for 1 gallon (16 cups) of potting mix to provide the micronutrients for your growing lettuce. Young lettuce needs a bright, full spectrum grow light, or a very sunny window. If your natural light is dim in winter, provide supplemental lighting for baby greens. The full spectrum grow light should be placed about 4″ above the top of the leaves. I use lights to grow lettuce indoors in January, when the natural light is lacking. 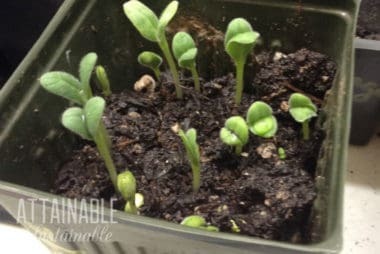 If you notice the leaves of your baby plants stretching and becoming spindly, lower the light to give adequate light for plant growth or raise the plants to get them within four inches of the light. If they are in a sunny window, this is an indication that they need supplemental light. Microgreens grow to harvest size from the energy inherent in the seed, so soil fertility isn’t as great a concern. On the other hand, baby lettuce leaves require nitrogen and trace minerals for fast growth. Sweet, tender baby lettuce leaves must grow fast to maintain their good qualities. Liquid kelp fertilizer, worm castings, or compost tea can ensure fast growth in your indoor winter garden. 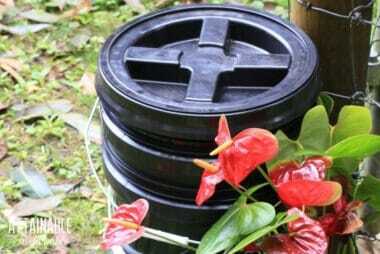 In a greenhouse you can also try fish fertilizer or manure tea, but these are too strong smelling to use in your home. Plan to feed your baby lettuce with liquid fertilizer after each harvest. When treated this way you can expect three harvests of baby lettuce from each planting, every 3 to 4 weeks. When you are finished harvesting your lettuce, just dump the soil in the compost, then wash and sanitize the container. Now you are ready to replant with fresh soil to start the cycle again. Since your container can be harvested every 3 to 4 weeks, consider staggering your plantings when growing lettuce indoors. (Kind of like the succession planting you’ll use in your outdoor garden.) 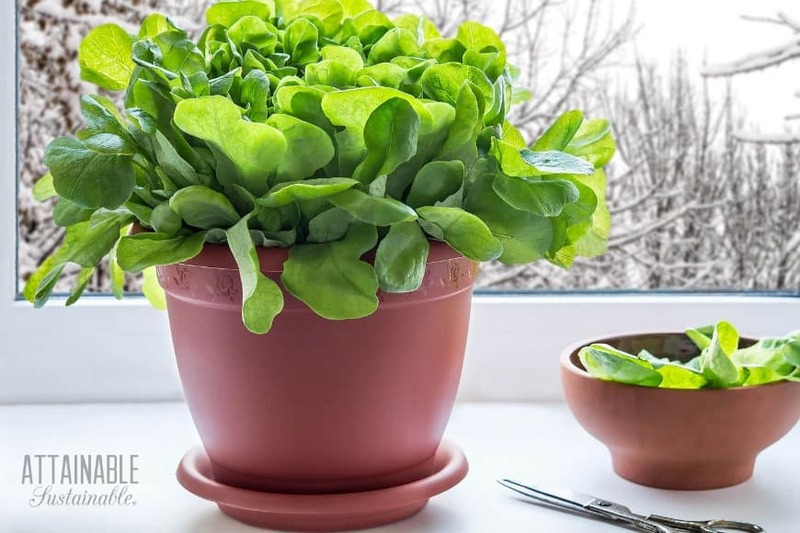 If you plant a new container every week, for a month, and give the lettuce what it needs to thrive, you’ll have a continual supply of lettuce over the winter. Where to get lettuce seed for growing indoors? Butterhead and loose-leaf lettuce varieties are the best choice to grow in containers. They mature faster than romaine and iceberg types, and make fast growth early on. Look for lettuce varieties that mature in 45 to 55 days. Or buy a mix of lettuce seed specifically chosen for baby leaf production. You can find seed in the specialty seed catalogs that cater to market gardeners. Many of these catalogs carry fast maturing lettuce with interesting leaf colors and shapes specifically for baby leaf production. In Canada I get my seed at West Coast Seeds (see pages 38 to 40 in their 2016 catalog). In the USA try Annie’s or Baker Creek. After four weeks your baby greens should be ready to harvest. The leaves will be 3-4″ high. Using scissors, cut them off ½ inch above the soil surface. Wash them well. Drain them or put them through a salad spinner. Use them as you would lettuce or spring greens in a salad or stir fry. You can grow lettuce indoors! Don’t hesitate to try growing lettuce at home. Lettuce seed is inexpensive. Soil is cheap. The investment in a grow-light set up will pay for itself over time. And if you live where the sun shines brightly year round, you don’t even need a grow-light to get started. Thanks for the helpful info, Didn’t know it needed deeper soil. Probably explains myfailure thus far, also probably need more light. Yes, that was a new little bit of advice for me, too! thanks so much for this….I have tried this in the past but fell victim to those pesky aphids and I won’t use sprays. I think growing this time of the year might avoid this problem…I will give it a go! 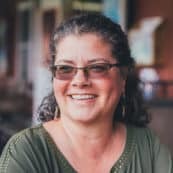 Diane, those aphids can be persistent. 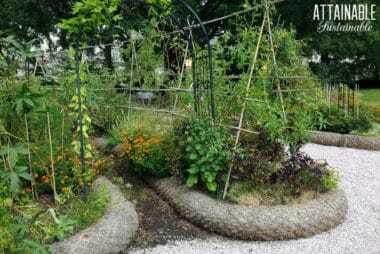 I’ve found that sprinkling some Diatemaceous Earth (it’s a fine white powder) on the soil surface and Spraying the leaves with a strong water spray helps. I hold the pot under my kitchen faucet so just the leaves get wet and it seems to do the trick. Hi Chris – This article is so helpful! Can you tell me if the container needs to have drainage? Can I just put soil in my old mixed greens clamshell or do I need to poke holes in the bottom? Yes, add some drainage holes. I use 4 ft. fluorescents 1 Sun light tube and 1 cool white tube, this gives you full Spectrum light on a budget. I got my lights set up on a timer. I got my fixtures at Lowe’s for $12.00, and the light tubes were $10.00 for 2 lights. You can fit 3 12×16 plastic vegetable containers under 1 set of lights. That grow light garden is a pretty cool invention. Personally, I just use regular fluorescent fixtures, but I grow a lot of different herbs and veggies in my basement, so my garden is much too big. But for a small herb or lettuce garden, that thing would work great and it looks a lot nicer than a huge light fixture.